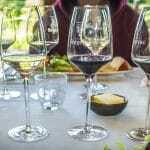 When it comes to pairing red wine with food are all red wines the same? Step 1: Try the 3 wines with the difference pieces of duck. EUREKA: the La Source and the Grace goes better with the rare duck and the Merlot 2007 goes better with the well cooked duck. The general rule of thumb is a high tannin wine with rare and low tannin wine with well done. So even how to cook the meat makes a difference to the wine you pair it with. If you like well cooked meat then our lighter vintages like 2007 will suit you best. 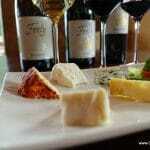 Step 2: Try the 3 wines with the difference cheeses. Do you think they work as well as the white wines we tried in part 1? While I sometimes love red wine with cheese in general white wines work better with cheese. Step 3: Try the 3 wines with the black chocolate. The Grace with its black fruit and dense mocha finish is a great match. This wine works with plain black chocolate or a bitter black chocolate dessert but don’t try to put it with a sweet light milk chocolate mousse as it will fail because it is not sweet enough. If you are eager to learn more about wine and food pairing why not visit us for a wine and food tour – we offer everything tours from half a day at Chateau Feely to five days in the greater region. The foods can be sourced at your local grocer. For the wine Feely wines can be ordered online at Order Feely wines online to ship in the EU.